This is an authentic Karnataka/Mysore style Bisibelebath recipe. This recipe is from mother, who prepares the dish with complete authenticity. First wash the dal and rice in a separate container. Add 2 cups of water to the washed rice and make it ready to keep in a pressure cooker. 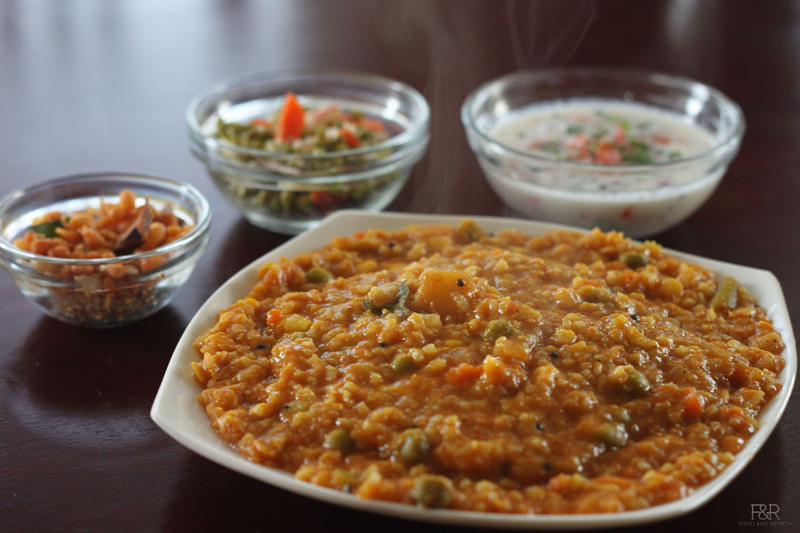 To the washed dal, add all cut vegetables along with the peas. Add around 3 cups of water and also the turmeric powder. Let it cool before you open the lid. Transfer this paste to a big pan and add water, salt, jaggery and curry leaves. Now add cooked dal and the vegetables. Add a tablespoon of oil. Mix well and let it boil for few more minutes. Keep stirring in between. Finally, add rice and mix well. At this time add a tablespoon of ghee. Let it be on the stove for 5 more minutes on a low heat and then turn off the heat. Remember to stir in between. Heat the remaining 2 tbsp oil in a ladle. Add hing and mustard seeds. Let it pop. Put this on the bisi bele bath and mix well. Enjoy the BisibeleBath with Boondi, chips or with raitha. I do not have Bisibele bath powder at home. Can I substitute with Sambar powder? Sambhar powder will not be a good substitute. Closest to Bisibele Bath powder would be, to mix Vangibath powder and Rasam powder, in 2:1 ratio. What vegetables to avoid for Bisibelebath recipe? Avoid Bell pepper (Capsicum) and tomato. They would take over the flavor of Bisibele bath. By avoiding these vegetables and using the right bisibele bath powder, your recipe will turn out to be the best bisibelebath recipe. Yes. You can avoid onion. I tried your recipe and it was finger licking gooood! My family loved it. Thanks to you for sharing it with us! I added cashews, finely chopped half capsicum and small sambar onions to the ghee seasoning to add some more flavor. Thanks for your feedback. You can try adding peanuts too. Hi Raji, thank you very much for all authentic Karnataka dishes. Thank you Ramya for your nice comments, I am happy you al liked this bisibele bath recipe. Excellent Recipe that is spot ON! Just a question: Can we use Marathi Muggu or Dagad Phool as well? Also, how much kopra should we add in the end? or is it just to taste? You can use but this is recipe from my mom, I just followed it. About kopra, if we add it while making the powder we cannot store it for long time. So I use fresh coconut when ever I am preparing the BBB. Grind it and add it. Sorry for late reply, this is my mother’s recipe. She doesn’t use the phool and moggu , but some people use. And about kopra I am using the fresh coconut itself. 1 cup is around 230mL (in volume). Can I substitute any other dal other than tuvar?